Two more county-wide news websites have been launched by a regional publisher following the merger of eight different local newspaper sites. Trinity Mirror’s Cornwall Live and Lincolnshire Live have been set up in line with the company’s recent trend of creating online brands covering entire counties, rather than individual newspapers’ patches. Similar rebrands have seen county websites set up for Essex, Gloucestershire, Kent and Somerset. Cornwall Live is now the online home of the West Briton, Cornish Guardian and Cornishman, while Lincolnshire Live hosts content from Lincolnshire Echo, Sleaford Target, Boston Target, Retford Times and East Lindsey Target. In Lincolnshire, TM titles the Grimsby Telegraph and Scunthorpe Telegraph have retained their own individual sites. The rebranded websites feature ‘In Your Area’ tabs, presenting readers with a choice of news from towns and villages, as well as region-wide news, sports, What’s On, traffic information and more from the wider area. The company says no jobs have been affected by the most recent changes. 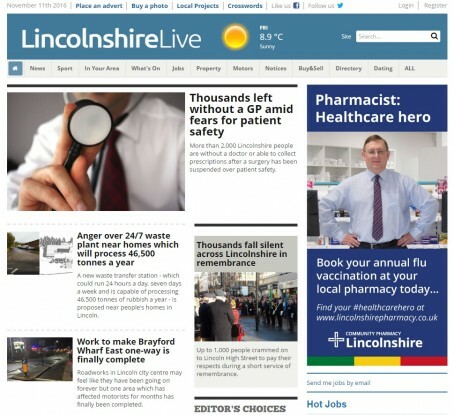 David Higgerson, digital publishing director at Trinity Mirror Regionals, said: “Lincolnshire Live and Cornwall Live follow the same model of hyperlocal news on a county-wide platform as the recently launched Essex Live, Kent Live, Gloucestershire Live and Somerset Live. That would be the same Lincolnshire Live which has absorbed the Retford Times website which covers a town in Nottinghamshire?? Hmm more from the TM spin machine here! In Sept 2015 the Essex chronicle site had a total audience of 302,000 readers with an engagement score (average number of pages x average time spent reading) of 12.8. A year later and Essex live has an audience of 139,000 (comscore Sept 16) so a 53.9% decrease. The current engagement score is 9.9 – a 22.6% decrease. With low engagement scores Essex 9.9; Kent 15.2; Somerset 22.5 and Gloucestershire 106.7 you have got one hell of a job to get the engagement up to the levels of braneed sites like the Swindon Advertiser = 268.8. I strongly suspect that the ComScore stats you’ve seen for September this year don’t account for the additional 290,000 unique users before the switch was made to Essex Live midway through the month. Then, there are so many ways to measure an ‘engagement score’. It’s essentially a made-up metric which can be a combination of quite a number of factors. The figure depends on whichever random event you decide to multiply by the amount of times it occurred. It also helps if you have the correct figures to start with! Oliver, understand where you are coming from and you make a common mistake amongst publishers in confusing your data types. Indeed the unique browsers figures for the Essex Chronicle might be as you say, however unique browser data is a blunt measurement that does not allow for multiple browser usage across multiple devices to be de-duplicated down to a single person. In this respect unique browser data over states the true audience, for my part I use four machine with a total of ten browsers, in an extreme case I could be counted ten time, but I am just one person. In this respect that is why I use comScore data which provides a de-duplicated figure. I take your point about the most up to date information and the Essex Chronicle average monthly reach for the Jan to July period was 416,000 monthly adults (comScore data – the industry standard audience measurement tool), which when compared to the Essex Live data is a massive 67% reduction on the 139,000 monthly audience posted by Essex Live in September. So my point is that TM have less audience not more and the average engagement metric (using my ‘crude’ calculation) shows that people are reading less pages and spending less time on sight – so in my eye not the success as stated. Sorry preach but the mistake isn’t mine. Using 10 browsers will not count you 10 times as a unique user, but you will generate 10 page views. The IP addresses of your four devices might count you four times though depending on how you connect to the server. On that point, office workers in larger organisations may all visit the site separately via a range of shared an IP address, meaning that not all will be counted individually as unique users. This and the fact that your typical user will access your website out of habit on one device means that the actual numbers for de-duplication is usually very small (usually around five per cent). Anyway, all that aside, I don’t doubt that there’s a drop in ‘engagement rate’ by whichever metric you choose to measure it. Regional publishers are pushing for reach, primarily via Facebook and Google, when there is only a finite number of people interested in local news. This strategy means more views from people further afield based upon sharing and search but, with not being local, they click on a headline, read, then leave straight away (I refuse to call this clickbait though!). I just don’t believe the audience figures are as extreme as you suggest.